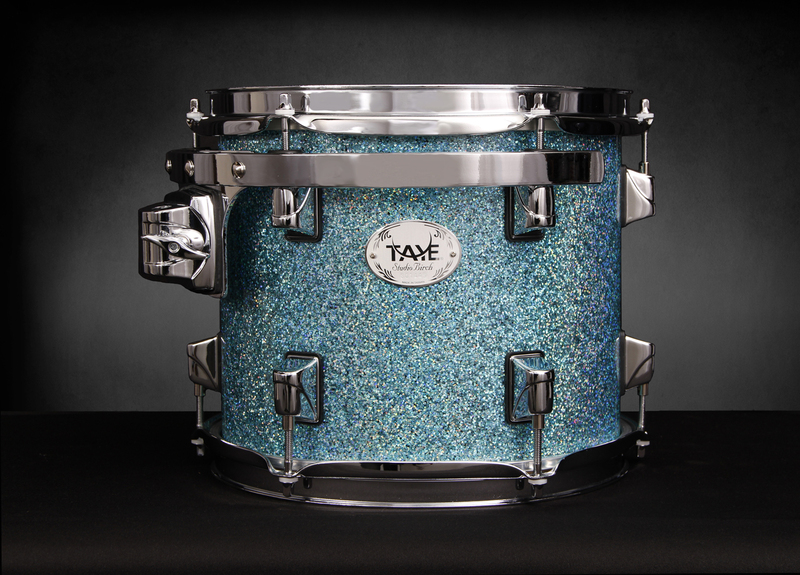 A seven-piece Taye StudioBirch is the net result of a selection process that lasted almost six months. The goal for the process was to identify and procure a drum kit that could serve as my main rig for many years to come. The entire selection and acquisition process is documented in our “Quest for the Holy Grail Drum Kit” article. The quest has been concluded and the drums are set up. 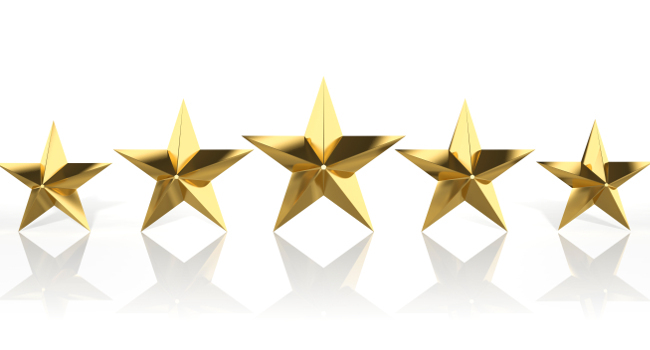 Thus here it is, -an exhaustive Taye StudioBirch Review. 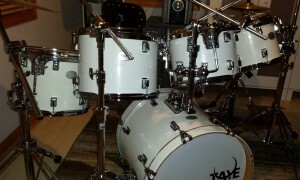 The subject kit is finished in a chilly “Galaxy Ice” white lacquer finish. A subtle, glossy white with a tinge of sparkle. Tastefully understated for long term appeal, yet striking enough to lend an elegant, striking character to the kit. The other available finishes are “Turquoise Sparkle”, “Autumn Red” and “Natural to Black Burst”. 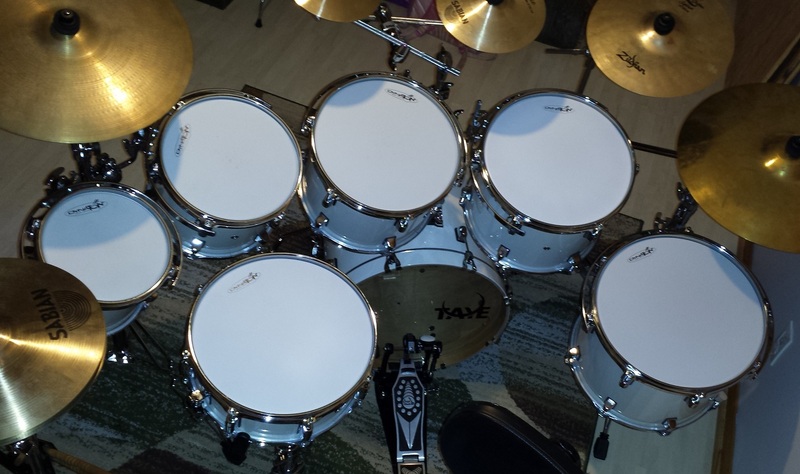 Wait a minute… what’s a seven-piece kit doing on CompactDrums.com? Well, the whole reasoning is stated in the above mentioned article, but, in a nutshell, the drums are selected for their ability to offer a multitude of four – five piece selections for bringing along, while at the same time offering a larger set-up in the jam-room / future home studio. For the same purposes, and being a preference of mine, all the toms are of the hanging “rack” tom variety. Thus the whole seven pieces can be combined in a variety of configurations. The current set up is four-up, one down, with the high toms protruding out left of the bass drum. Sizes of the kit reviewed are, Bass drum: 18″ X 16″, Snare drum: 13″ X 5″ and Toms: 14″ X 11″, 13″ X 10″, 12″ X 9″, 10″ X 8.5″, 8″ X 8″. Having unpacked Taye drum kits before, I already knew to expect lots of packaging material. In fact so much that after the drums are out of the sturdy boxes and the filler returned, the boxes are still full. 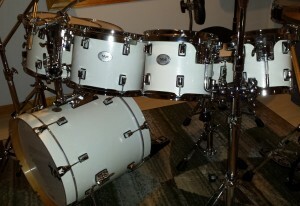 The drums are all pre-assembled except for the bass drum, which in this case housed a tom and the snare drum. Further the assembled drums are pre-tuned to a certain degree, which of course means they need to be tapped to “test the tone” out of the box. First sound impression: Sustain. Lots of sustain. From a visual perspective the Galaxy Ice finish is stunning. Like new-fallen snow. The clean white colour also makes the comparatively speaking small sizes appear substantially bigger. 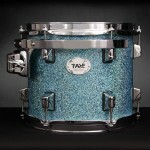 As is the case with every Taye drum I’ve seen before, the finish is flawless. Perfectly gleaming and uniform. 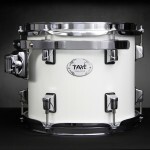 Most Taye drums share the same modest rectangular badge. 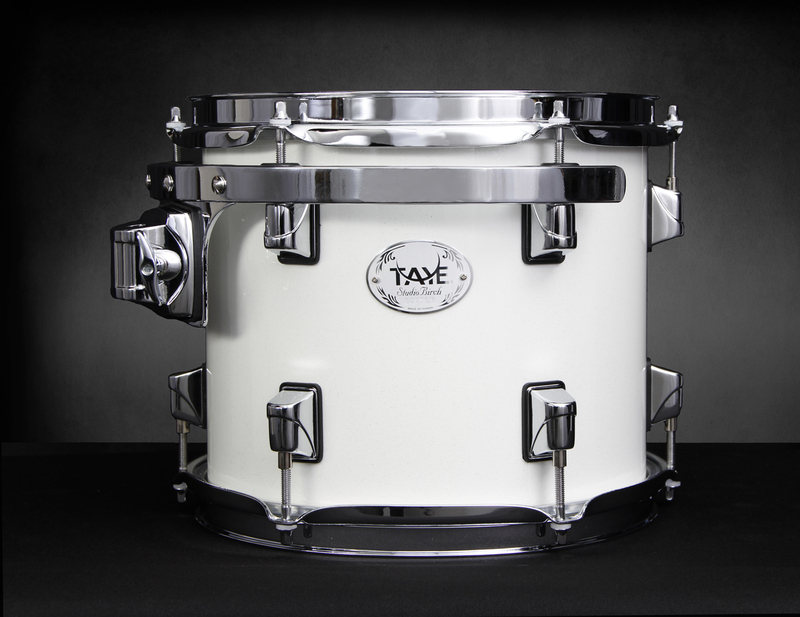 The StudioBirch though have an oval aluminum-coloured badge that blends in perfectly with the white, ice-like finish. Apart from the seven drums, there is the “SlideTrack” post (More on this in the “Construction and Design” section. ), a box with the claw-hooks and tension rods for the bass drum, the spurs and five ball joint, L-rod tom holders. The single tom holders are a clever design that can quickly be coupled up making a double tom holder from two single ones. 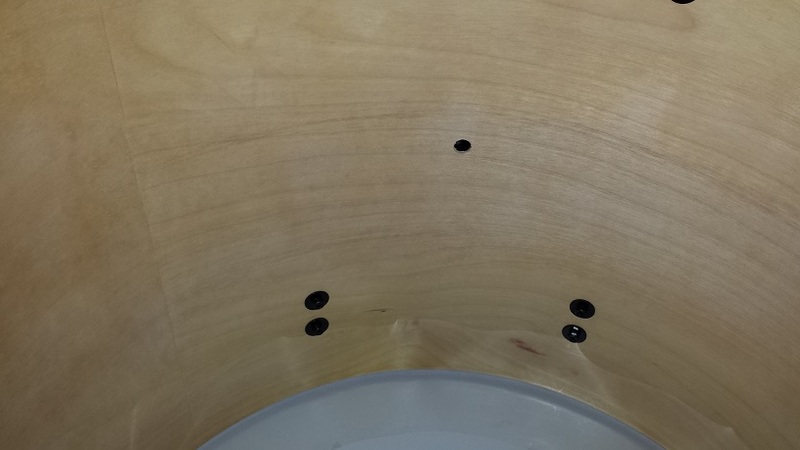 Since the bass drum comes partially dis-assembled there is an opportunity for a quick peek inside. 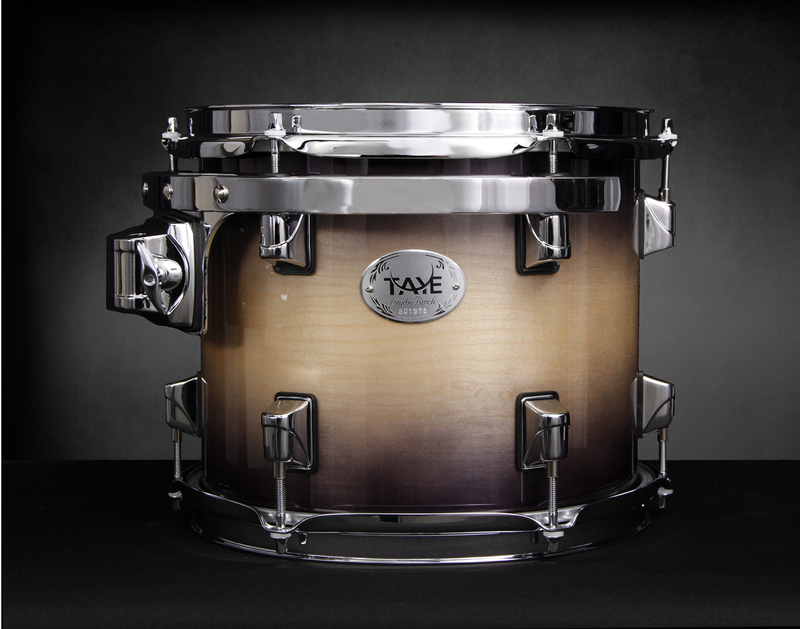 As with other Taye drums, the interior surface is smooth as silk, with a satin-like finish. The bearing edges share the same perfect smoothness. Running my hand around the rim doesn’t reveal even the slightest unevenness. Tayes bearing edges deserve a separate mention. The inside edge is the standard 45 degree “slope”, while the outside bevel, also 45 degrees has slightly rounded over edges. Not enough to be considered a round-over but more than the more commonly found, sharper edges. The result is a slight increase in head-to-shell contact compared to standard 45/45 edges. More on this in the “Sound, Tuning and Tone” section. Once unpacked it’s understandable to be eager, maybe even anxious to get the kit set up, tuned and tested. However, I know from experience to discipline myself and perform examinations and measurements before any kit assembly takes place. One by one, the drums go on the work bench to get their hoods popped and insides checked out. Four important aspects are scrutinized. 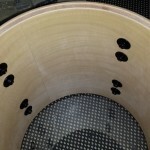 The interior finish, Shell “roundness”, Bearing Edge “Flatness” and Bearing Edge surface. These are all tested against a baseline of what we consider acceptable for the price range. 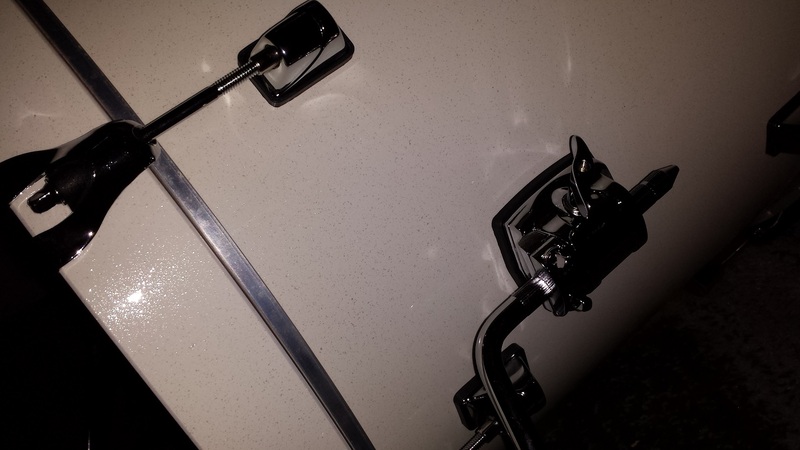 For example; With entry level drums we can live with “out-of-round” and out-of-flat discrepancies of 3-4 mm. maybe even more for the larger drums. On the same token we’re not expecting perfect surfaces of either bearing edges or the shell interior. As we go up the price levels, our expectations increase. 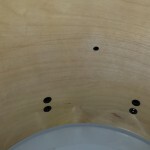 For a higher end drum line such as the StudioBirch we consider up to 2 mm discrepancies acceptable for the bass drum, 1.5 mm for the larger toms and snare drum while the smaller toms are expected to fall within 1 mm. Interior surfaces should be near perfect with only minor imperfections. 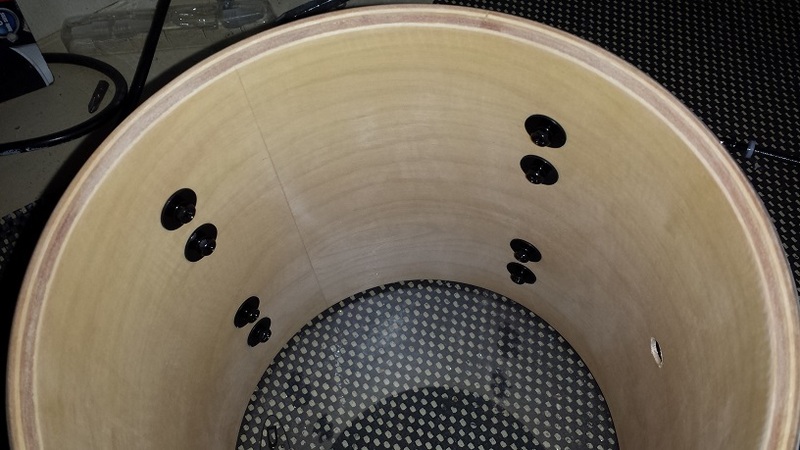 Bearing edges should be smooth although very minor inconsistencies due to ply make-up is acceptable. 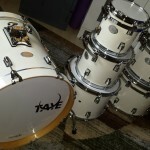 So, how did these snow-white shells fare in this section of the Taye StudioBirch Review? We are very pleased to report that they fared far better than expected in this price range. The bass drum displayed less than 0.5 mm “out-of-round” and zero measurable “out-of-flatness” The rest of the shells are all between 0.0 and 0.3 in both measurements, which is far better than average. Arguably, this could even be considered “Stellar”. The shell interiors are all 100% flawless with a uniform, perfectly smooth and satin-like surface throughout. A couple of minor inconsistencies can be felt along the bearing edges of the bass drum and one tom, but neither is visible to the eye, even with my good reading glasses. The bearing edges are all butter-soft, smooth and of a consistently even profile. Overall the shells pass the workbench inspection with flying colours. 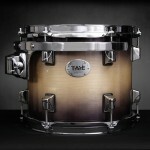 As with every Taye drum we’ve ever inspected, the outside lacquer finish is flawless, uniform and perfect in every way. The shell pack metal parts and mounting hardware is of consistently high quality, of heavy gauge construction and without flaws or imperfections. 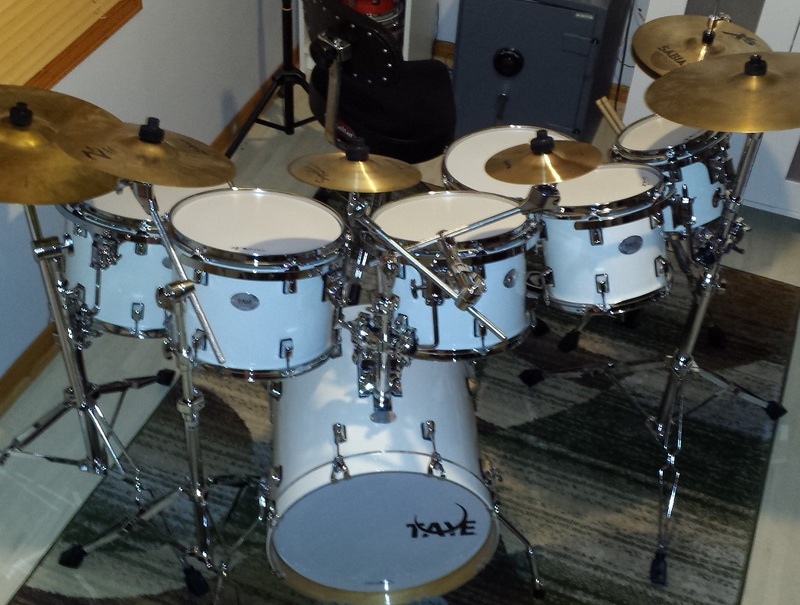 All of Taye’s drum kits ranging from the mid level, up to the higher end lines, share a plethora of patented innovations exclusive to Taye in addition to some nifty solutions that aren’t necessarily ground-breaking enough to be patented. 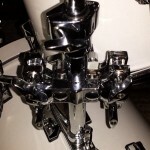 We already mentioned the Ball-joint, L-rod tom holders that come as single units, but can be coupled up into dual tom holders. Another example of “Configuration Friendliness”. 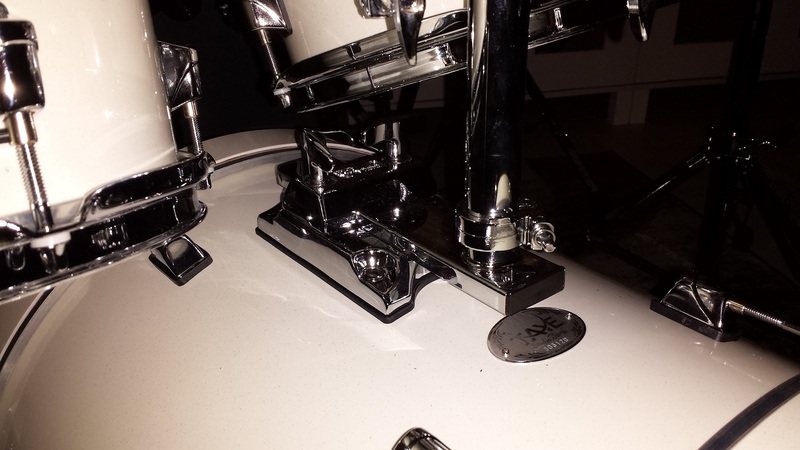 One of my favourite Taye hardware innovations is the “SlideTrack” tom mounting platform on the bass drum. 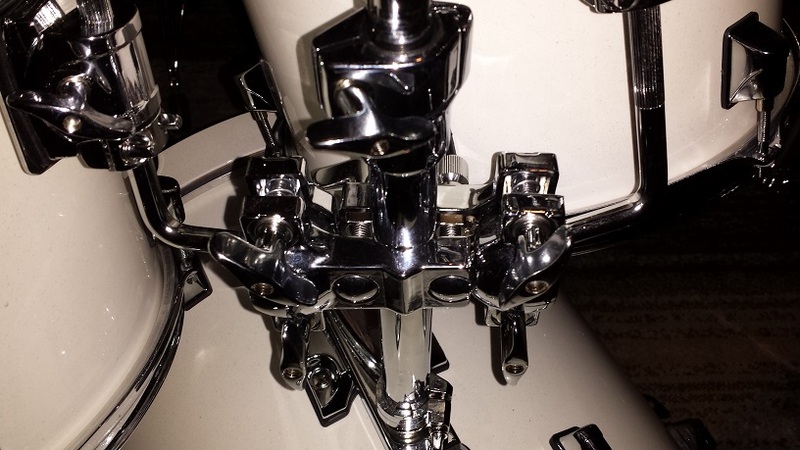 A slick design that not only adds lateral adjustment of tom placement, it also allows for mounting the toms to a “virgin” bass drum. All tom mounting, leg mounting and spur mounting brackets are of a design Taye call “PocketHinge“. As the name implies the bracket has an internally hinged latch that hugs the rod or leg around it’s perimeter. The result is a firm grip without having to “white-knuckle” the wing screw. Springflex Spurs, Studded Gaskets, Articulated Claw Hooks and the SideLatch strainer are other examples of small yet significant improvements Taye have performed to make our lives just a little bit easier. These are all explained in the right column. 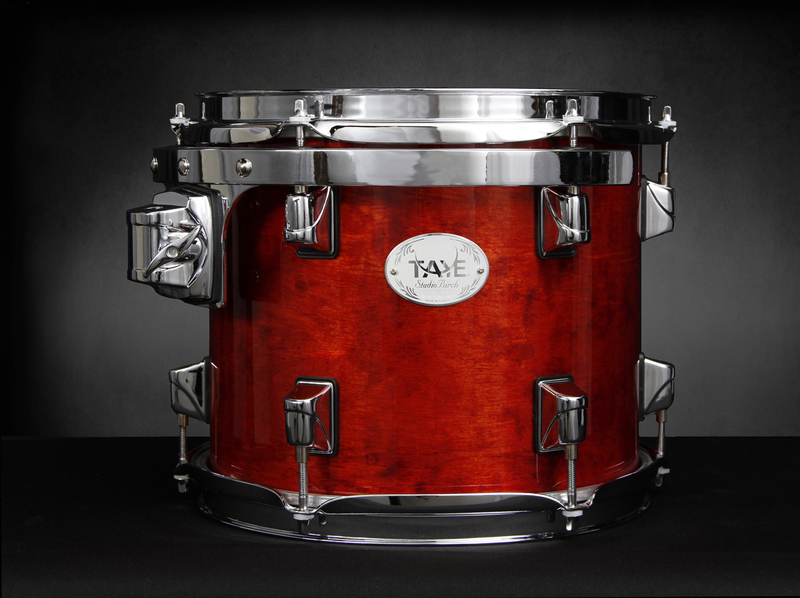 Compared to drums with standard 45/45 degree bearing edges, Taye’s slightly smoothed-over outside 45 degree bevel increases head-to-shell contact at the outer plies. In turn this results in slightly shifting a portion of resonance from the head to the outer plies of the shell. Think of it this way; Striking the drum’s head causes it to vibrate, the vibration is forced down into the drum, causing the opposite head to vibrate, while to a smaller degree inflicting resonance to the inner plies of the drum shell. The contact surface between the head and the shell, at the bearing edge also directly conducts vibrations into the shell. Slightly increased contact area equals a slight increase in conducted vibrations. This is the reason we notice a difference in the sound’s character depending on the wood species used to construct the drum. 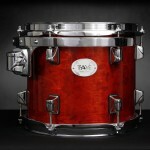 Birch is said to lend a neutral, punchy, clear and loud character to drums. The punchy, clear and loud portions due to the hardness of birch and denseness of the wood’s fibres. In the case of Taye’s StudioBirch the mentioned birch characteristics are clearly distinguishable. In addition a large portion of sustain is added to the mix, likely in part due to the aforementioned increase in head-to-shell contact and to a smaller degree enhanced further by the coated, single ply heads. Long story short; these drums have all the sustain and resonance one could ever ask for. This opens some new tuning options in the realm of higher or lower tuned resonant side heads. Usually a large spread in tuning between the heads means reduced sustain which quenches some of the other decay effects that come with these tunings. On these drums I haven’t found a tuning that can dampen the sustaining ring enough to drown out the decay affects. With the resonant side heads tuned lower we can therefore wring out some very interesting boing or pitch shift decays depending on the relationship between the pitches. Likewise a higher tuned resonant side also has a markedly more noticeable effect than what would be expected. perhaps the most interesting tuning experiment we conducted was this: First find a pitch that suites the drum in question. In this case the 13″ tom. Then using the Resotune II (Reviewed here), we tuned both heads to the same identical pitch and cleared the lugs meticulously, for maximum sustain. A little bit of additional tweaking yielded a level of sustain I can honestly say that I have never experienced before. Literally, a moderate blow with a drumstick set in motion a tone that just kept on ringing for what seemed like minutes. Then, all of a sudden, it continued to ring a while longer. I’m not one to resort to tape or goop, but short of changing out the heads, even I might reach for some damping aids for certain types of music with these drums. On the other hand you can’t suppress or attenuate something that isn’t there to begin with and the Taye StudioBirch has all the overtones, sustain and resonance that can be reasonably requested. I can see a lot of fun experimenting in the studio in my future. Just as broad as the tuning option, is the tuning range. This was already expected considering the hardness of birch coupled with the excellent tolerance results we measured. The drums produce a tone with barely any tension on the head at all, and with some of the toms I believe the heads were stretching before the drum’s shell reached it’s upper limit. The bass drum also has the same characteristics. For heavy rock a pillow may be necessary. We also found some interesting tone with a folded towel inside the shell not touching any of the heads but rather only attenuating the shell vibrations. The snare drum has quickly become one of my favourites. The 13″ diameter turned out to be a wise choice for a birch snare. It’s plenty loud enough and has a range spanning from a snarly grown through the varying cracks and all the way up to sharp pops. If I had to find something to criticise it for it would have to be a slight lacking in it’s depth, but I’d be crazy to expect any seriously deep tones from a 13″ birch snare. Versatility was one of the main criteria in selecting the StudioBirch line and these drums deliver exactly that. Articulate enough to sound “right” when played softly, while punchy enough that the smaller size drums easily hold their ground in a jam or gig setting. Excellent build quality ensures a broad tuning range and long term durability. Resonance and sustain are out of this world, but can be controlled when required. The well thought-through hardware design adds cream to the icing, delivering flexibility and convenience. CompactDrums.com award the Taye StudioBirch our highest recommendation and our second ever five star review score! This “Configuration Friendly Concept” carries through Taye’s four best-selling lines, offering around 100 combinations of said lines as pre-priced packages. 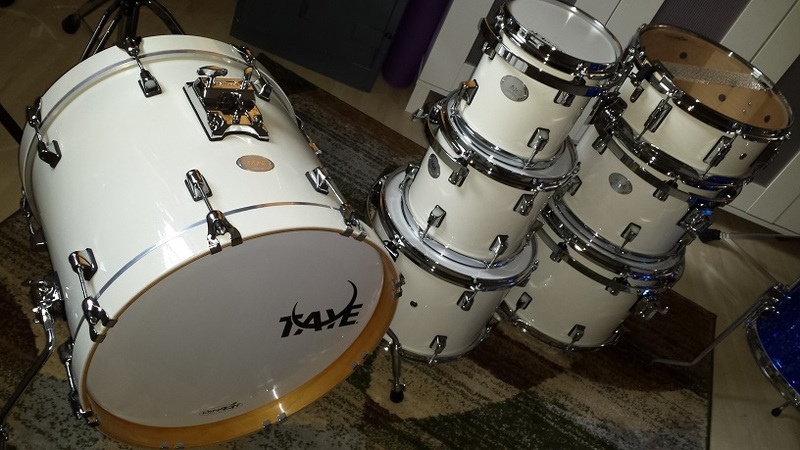 For me this was a pleasant surprise as my ultimate drum kit, that I thought I had “Custom-Speced” turned out far more affordable than I had anticipated. “Imagine attack, presence and control in an instrument that is universally musical and incredibly extraordinary in appearance. Birch is revered by drummers seeking to cut through the mix; it is the wood of choice for achieving accentuated highs and lows with reduced mids, producing timbre with striking clarity and punch. 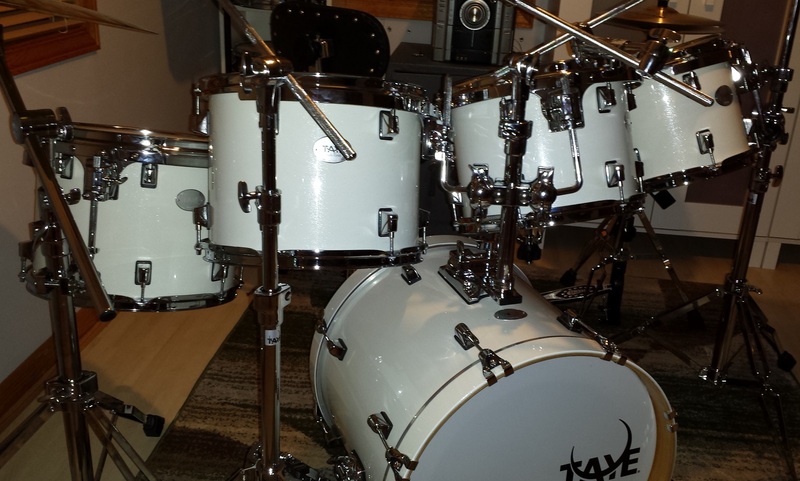 StudioBirch drums are constructed from hand selected birch plies, and have been painstakingly engineered utilizing Taye’s exclusive EFS™ shell technology to provide the optimum resonance and tonality.